Summer classes now listed (downloadable PDF calendars to be uploaded soon)! Now offering Merit Badges in Animal Science, Mining in Society, Reptile and Amphibian Study, Stamp Collecting, and Weather! Animal Science Merit Badge – $50: Wear Class A Uniform, bring your scout book, pen or pencil, blue card, lunch, and money for vending machine. Prerequisite’s: none – Everything will be completed during the class. Camping Merit Badge – $55: Wear Class A Uniform, bring your scout book, pen or pencil, blue card, lunch, and money for vending machine. Chess Merit Badge – $50: Wear Class A Uniform, bring your scout book, pen or pencil, blue card, lunch, and money for vending machine. Items that need to be completed at home: We should be able to complete all sections while you are here. Citizenship in the Community – $60: Wear Class A Uniform, bring your scout book, pen or pencil, blue card, lunch, and money for vending machine. Citizenship in the Nation – $40: Wear Class A Uniform, bring your scout book, pen or pencil, blue card, lunch, and money for vending machine. Citizenship in the World – $40: Wear Class A Uniform, bring your scout book, pen or pencil, blue card, lunch, and money for vending machine. Communications – $50: Wear Class A Uniform, bring your scout book, pen or pencil, blue card, lunch, and money for vending machine. Cooking – $50: Wear Class A Uniform, bring your scout book, pen or pencil, blue card, lunch, and money for vending machine. Cycling Merit Badge – $60: Wear Class A Uniform, bring your scout book, pen or pencil, blue card, lunch, and money for vending machine. Dentristry – $35: Wear Class A Uniform, bring your scout book, pen or pencil, blue card, lunch, and money for vending machine. Emergency Preparedness – $40: Wear Class A Uniform, bring your scout book, pen or pencil, blue card, lunch, and money for vending machine. Environmental Science – $60: Wear Class A Uniform, bring your scout book, pen or pencil, blue card, lunch, and money for vending machine. Family Life – $40: Wear Class A Uniform, bring your scout book, pen or pencil, blue card, lunch, and money for vending machine. First Aid – $45: Wear Class A Uniform, bring your scout book, pen or pencil, blue card, lunch, and money for vending machine. Hiking Merit Badge – $55: Wear Class A Uniform, bring your scout book, pen or pencil, blue card, lunch, and money for vending machine. Law Merit Badge – $55: Wear Class A Uniform, bring your scout book, pen or pencil, blue card, lunch, and money for vending machine. 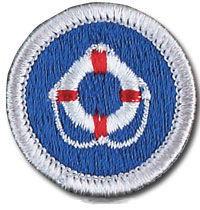 Lifesaving Merit Badge Course: 10:30am – 3 to 4pm. Times are approximate based on number of students and abilities. Wear Class A Uniform, bring scout book if you are not at least First Class, blue card, bring swim suit, towel, goggles, lunch, money for vending machine, clothes to get in the pool (pants and shirt). Medicine – $35: Wear Class A Uniform, bring your scout book, pen or pencil, blue card, lunch, and money for vending machine. Mining in Society Merit Badge – $50: Wear Class A Uniform, bring your scout book, pen or pencil, blue card, lunch, and money for vending machine. No Prerequisite’s/Items to be completed at home: All items will be completed in class. Personal Fitness – $40: Wear Class A Uniform, bring your scout book, pen or pencil, blue card, lunch, and money for vending machine. Personal Management – $50: Wear Class A Uniform, bring your scout book, pen or pencil, blue card, lunch, and money for vending machine. Reptile Merit Badge – $50: Wear Class A Uniform, bring your scout book, pen or pencil, blue card, lunch, and money for vending machine. Salesmanship Merit Badge – $55: Wear Class A Uniform, bring your scout book, pen or pencil, blue card, lunch, and money for vending machine. Appts can be set upon completion of OW Course! Snorkeling Award for snorkeling safety awareness is the recommended procedure conducting BSA swimming activities using masks, fins, and snorkels. Safe Swim Defense guidelines are applicable and Snorkeling Safety clarifies and extends Safe Swim Defense concepts to situations encountered during training and open water snorkeling. Stamp Collecting Merit Badge – $50: Wear Class A Uniform, bring your scout book, pen or pencil, blue card, lunch, and money for vending machine. Sustainability Merit Badge – $55: Wear Class A Uniform, bring your scout book, pen or pencil, blue card, lunch, and money for vending machine. 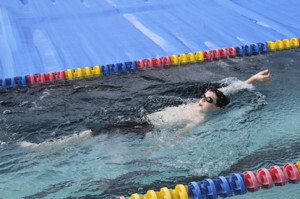 Swimming Merit Badge Courses: 10:30am – 2 or 3pm Times for the course are subject to the number of students and abilities. Wear Class A Uniform, bring scout book if you are not at least First Class, blue card, bring swim suit, towel, goggles, lunch, money for vending machine. Prerequisites can be completed the day of the merit badge for $25. Weather Merit Badge – $50: Wear Class A Uniform, bring your scout book, pen or pencil, blue card, lunch, and money for vending machine. If the Boy Scout is not at least First Class, we offer these Prerequisites the day of the Merit Badge for an additional $25. Complete Second Class rank requirements 8a through 8c and First Class rank requirements 9a through 9c. (8c) Demonstrate water rescue methods by reaching with your arm or leg, by reaching with a suitable object, and by throwing lines and objects. Explain why swimming rescues should not be attempted when a reaching or throwing rescue is possible, and explain why and how a rescue swimmer should avoid contact with the victim. (9a) Tell what precautions must be taken for a safe trip afloat. Demonstrate “reaching” rescues using various items such as arms, legs, towels, shirts, paddles, and poles. Demonstrate “throwing” rescues using various items such as lines, ring buoys, rescue bags, and free-floating supports. Successfully place at least one such aid within reach of a practice victim 25 feet from shore. Show or explain the use of rowboats, canoes, or other small craft in performing rescues. Remove street clothes in 20 seconds or less and use a nonbuoyant aid, such as a shirt or towel, to tow the subject to safety. Explain when it is appropriate to remove heavy clothing before attempting a swimming rescue. In deep water, show how to escape from a victim’s grasp on your wrist. Repeat for front and rear holds about the head and shoulders. Explain the signs and symptoms of a spinal injury. Support a faceup victim in calm, shallow water. Swimming is a leisure activity, a competitive sport, and a basic survival skill. Scouts who earn this badge will learn about safety when swimming and diving, how swimming can contribute to overall fitness and health, and gain some basic competitive swimming skills. If the Boy Scout is not at least First Class, we offer the Prerequisites the day of the Merit Badge for an additional $25. 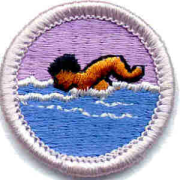 NOTE: The requirements for the Swimming merit badge have been revised. A Scout who has already started working on the merit badge when the 2014 edition was introduced, may continue to use the same merit badge pamphlet to earn the badge and fulfill the requirements therein. In other words, the Scout need not start over again with the new pamphlet and revised requirements. The revised requirements as presented here become official Jan. 1, 2015, and will appear in the 2015 Boy Scout Requirements book. Following the guidelines set in the BSA Safe Swim Defense, in water at least 7 feet deep*, show a standing headfirst dive from a dock or pool deck. Show a long shallow dive, also from the dock or pool deck. *If your state, city, or local community requires a water depth greater than 7 feet, it is important to abide by that mandate. Counselors for the Scuba Diving merit badge must be registered with the Boy Scouts of America and be approved by the district/council advancement committee. The merit badge counselor should be fair and consistent when presenting and evaluating the knowledge and skills specified by the requirements. None of the requirements may be modified or omitted. Jump feet first into water over the head, level off, and begin swimming. Swim 75 yards in a strong manner using one or more of the following strokes: side, breast, trudgen, or crawl. Swim 25 yards using an easy, resting backstroke. The 100 yards must be completed without stops and must include at least one sharp turn. Rest by floating…Long enough to demonstrate ability to rest when exhausted. Swim 25 feet on the surface. Stop, turn, and resume swimming back to the starting place. Did not complete either of the swimming tests.